This woman was saved by the photographer, who grabbed the back of her coat and pulled her up and over the railing. I’m taking a course on Death & Dying. Our last period focused on murder, mass murder, natural disasters, serial killers, and suicide. It wasn’t the most uplifting class. We watched a documentary titled “The Bridge”. 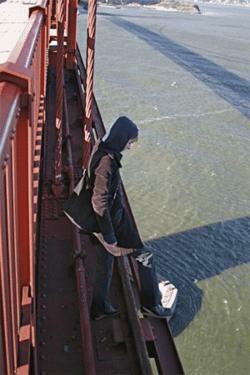 The directors set up cameras to record a year of death at one of the top suicidal destinations in the world, The Golden Gate Bridge of San Fransisco, California. It broke my heart to watch these people jump, hear their stories, and see the grief experienced by their loved ones. What hope is there for those who choose such a bitter end?